In stock -This product will ship today if ordered within the next 10 hours and 41 minutes. Skin healing rosehip, evening primrose and borage oils provide the perfect mix to assist the nightly repair and restoration of healthy skin cells while aloe vera soothes tired skin. 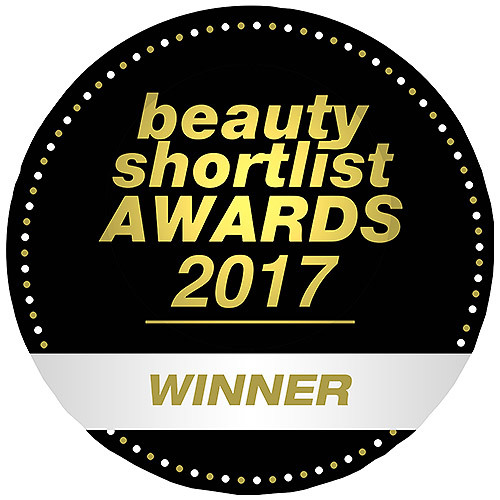 Bronze Medalist in the 2012 Free From Skincare Awards! Also the Gold Winner of Skin Moisture Cream category at Watson’s Health and Beauty Awards, Hong Kong 2009. Water (Aqua), Aloe Barbadensis Leaf Juice, Sesamum Indicum (Sesame) Seed Oil , Cetearyl Alcohol, Cetyl Alcohol, Glycerin, Ceteareth-20, Rosa Canina Fruit Oil (Rose Hip), Theobroma Cacao (Cocoa) Butter, Butyrospermum Parkii (Shea) Butter, Simmondsia Chinensis (Jojoba) Seed Oil, Tocopherol (Vitamin E), Persea Gratissima (Avocado) Oil, Triticum Vulgare (Wheat) Germ Oil, Oenothera Biennis (Evening Primrose) Oil, Borago Officinalis (Borage) Seed Oil, Equisetum Arvense Extract (Horsetail), Arctium Lappa Extract (Burdock), Urtica Dioica (Nettle) Leaf Extract, Citrus Tangerina (Tangerine) Peel Oil, Citrus Nobilis (Mandarin Orange) Peel Oil, Lavandula Angustifolia (Lavender) Oil, Vanillin, Vanilla Planifolia Extract, Citrus Paradisi (Grapefruit) Extract, Phenoxyethanol, Benzyl Alcohol, Limonene*, Linalool*. *Natural component of essential oils. After cleansing at night, gently massage into face, neck and décolletage. 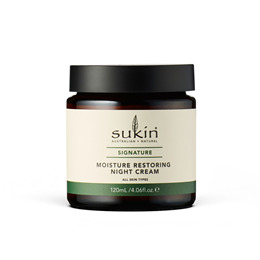 Below are reviews of Sukin Moisture Restoring Night Cream - 120ml by bodykind customers. If you have tried this product we'd love to hear what you think so please leave a review. My skin is very sensitive, prone to redness and its itches, badly. Its an absolute nightmare to find the right skincare product. Started to use this product not long ago and I can already see and feel the difference. My skin feel well hydrated no redness and the main benefit, no itching. Could not be any happier. This soaks in, is light and doesn't clog your pores, I also use the sensitive daily moisturiser which is also great....! 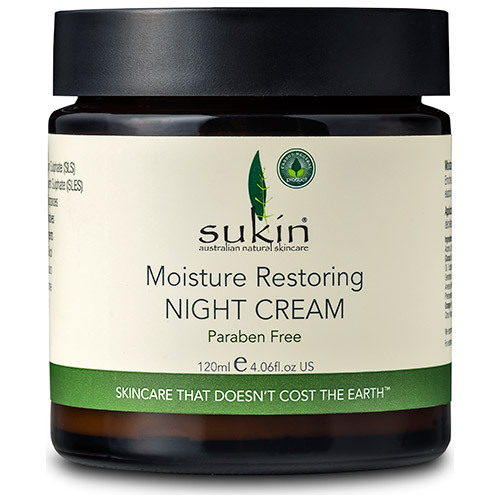 This is a truly wonderful night cream. It smells heavenly and has a lovely consistency. My skin looks so much better since I've been using it.